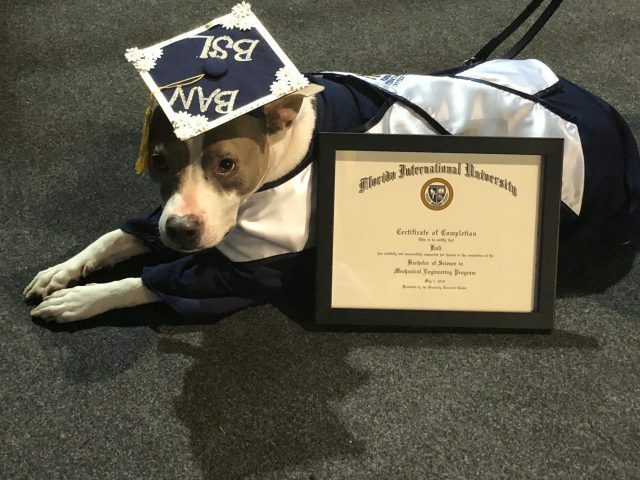 A seven-year-old Pitbull named Kali made FIU history. 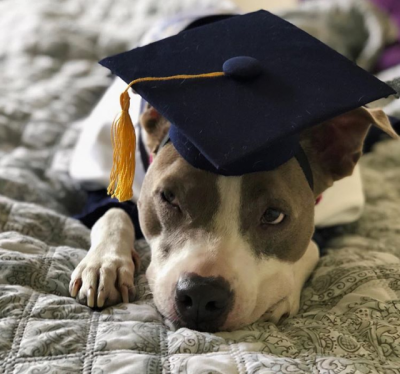 During this year’s spring commencement, Kali received a notable distinction for her hard work supporting her owner, Worlds Ahead Graduate Tiffany Ascanio. 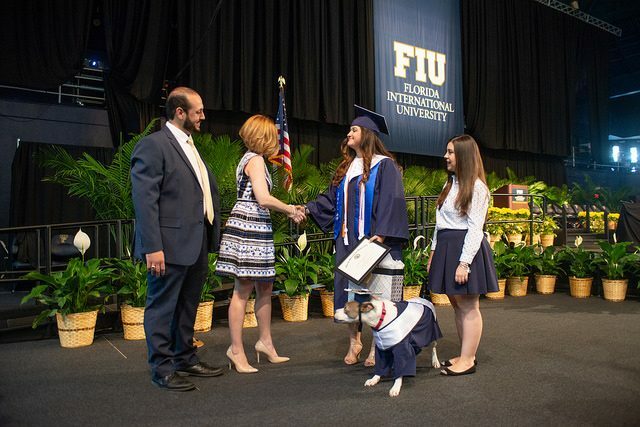 “She is the first service dog to be recognized by FIU’s Disability Resource Center with a certificate of completion,” announced President Mark B. Rosenberg. “The Disability Resource Center is always developing and researching innovative, effective and powerful ways to help support our students,” says Stephen Loynaz, access consultant manager for the Disability Resource Center. During her first semester at FIU, Ascanio needed to find a preemptive measure to help her cope with an ongoing medical condition. After much research, she decided to have her canine, Kali, go through service dog certification training. Unlike pets, service dogs are defined by the American Disabilities Act (ADA) as primarily working dogs trained to perform tasks for a person with a disability. By law, they can guide their owners in all public areas, including classrooms and libraries. 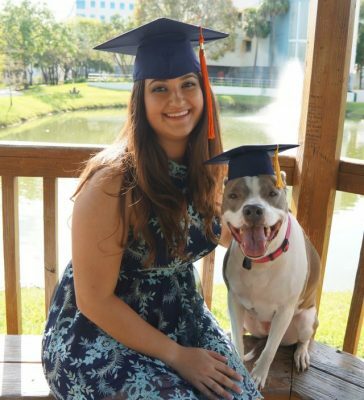 Kali, who is protected by the ADA against breed specific legislation in Miami, accompanied Ascanio at FIU as she pursued her mechanical engineering degree. The Blue Nose Pitbull, not only put in her share of sleepless nights, but also hit it off with countless students. Ascanio represents a lot of students who need to receive different types of support and accommodations including access to their service animals. “We are really thrilled that Tiffany has been able to bring this narrative to life for our FIU community to embrace and celebrate,” says Amanda Niguidula, director for the Disability Resource Center. Both Ascanio and Kali are headed to Seattle where the graduate was recently hired by Boeing commercial airplanes as a manufacturing engineer. But first, the dynamic duo plan on taking a well-deserved road trip where Kali will enjoy some of her favorite things including hiking, being in the water and visiting dolphins at the aquarium. “FIU has completely supported me throughout and that’s something I truly appreciate,” says Ascanio. 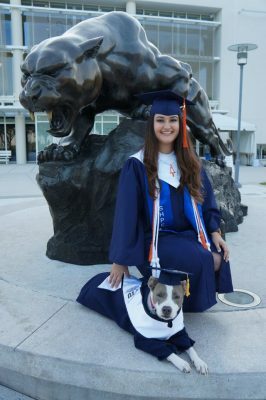 Kali is the first service dog to be recognized at FIU with this distinction, but the Disability Resource Center hopes she will not be the last! FIU welcomes service and emotional support animals with the appropriate documentation. Students that wish to have their service animal considered for the certificate of completion are encouraged to register them with the Disability Resource Center. So what is the message here other than PIT BULL and BSL? Lots of service dogs out there doing incredible things. Preferential treatment for this breed is getting really tiresome. Preferential treatment for this breed? Are you kidding me? They are the most discriminated breed out there period. Stories like this will continue to push the rhetoric in a positive manner. These dogs deserve (and need) positive press like this in order to pull them out from under laws out in place by ignorant people. Sorry to disagree. These laws were put in place after a series of deadly attacks from this breed and the ones who are implemented these laws and rules were politicians elected by voters, not ignorants as you called them. Research more. That being said, all rules have exceptions and this beautiful dog is one huge exception. What a horrible response. All breeds deserve to be recognized. However, this time it was just a pitbull. Dont kid yourself. You know they were given a bad name and this is a great start to rebuilding a relationship with this breed. Shout it from the rooftops! Service Dogs Rock! We have been studying the positive effects of service dogs on PTSD, MS, Mental disabilities of all sorts, and…finally….the world is listening. Agreed this helps me get approved tenants in my RE transactions I agreed that dogs rock no matter where and for what reason ! God created them as he created all animals including the ones who refuse these laws! Way to go Tiffany and Kali, I wish you success in your new adventure.